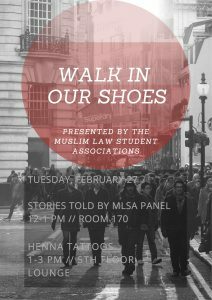 How does being a Muslim affect your career and experience here? Mahira – I want to be a prosecutor, and my sense of justice and fairness is affected by my faith, it gives me a sense of focus and direction. Sameeul – Islam is not just a religion, it’s a way of life. So it affects my experience through things like not drinking and Friday prayers. It’s important to communicate with employers early to set expectations and prove you aren’t being unprofessional with long lunches, for instance. 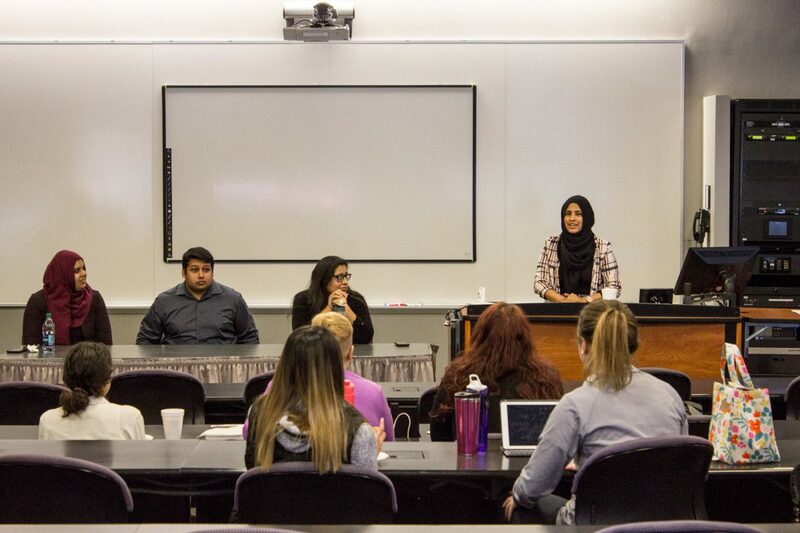 Saman – The reason I ended up going to law school is that growing up, the value of doing good for others/being compassionate was a religious view embedded in me early on, and law is the method in which I want to do that. So for me it acts as motivation. Shahina – I made sure to emphasize my needs for isolated space to pray multiple times a day. Here at school, we have a prayer room that is available to students. At work, they put a sign up in a specific room for me and reserved it for the hours that I pray. Have there been challenges as a Muslim at networking events? Mahria described someone asking her “Sweetheart, are you lost?” at her first networking event at Chicago-Kent as she was getting off the elevator. She told them she was exactly where she was supposed to be. While working in a domestic violence legal clinic, people kept assuming she was a victim. While working for the State’s Attorney’s office in a courtroom, someone thought she was an Arabic interpreter rather than a law clerk. Sameeul was surprised by how few people have met Muslims. He would prefer not to have to be the introduction for them since people are often surprised by small things like not drinking and think that might be a social challenge. As a debate coach, he regularly encouraged students to open up questions and learn from people, which has helped in these conversations. 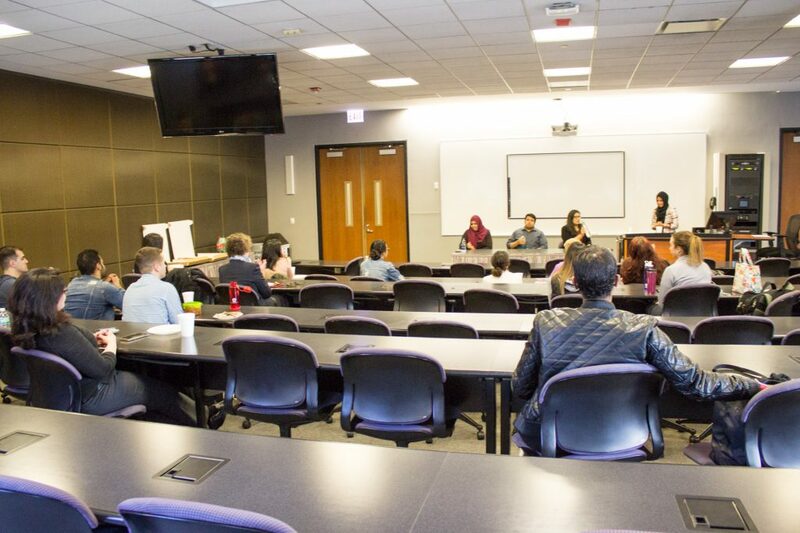 While alcohol may be the norm at networking events, Saman said people at Chicago-Kent have been welcoming. It can be awkward when people assume everyone at a networking event does drink, or when people said that is the only reason they would be there. 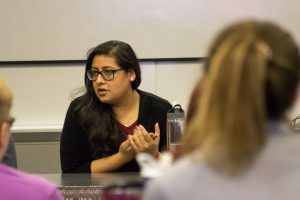 Because of her height and manners, Shahina said people often assume she’s younger or less intimidating and come up afterward to tell her they were surprised by her performance in court. Do people ask you intrusive questions? Sameeul said it’s usually clear whether or not the question comes from a place of malice. Many people feel more awkward asking questions, and he doesn’t mind responding. Most offensive questions have come from people who think they already know the answers. Years ago, in a debate, Sameeul saw someone making really broad inaccurate statements about sharia law and was surprised to see how quiet other coaches were about addressing what was wrong. Saman agreed that she doesn’t mind being open and having conversations when people are curious about her life and want to get to know her. But when people ask if she’s a “real Muslim” for not choosing to cover with the hijab (head scarf), that is frustrating. 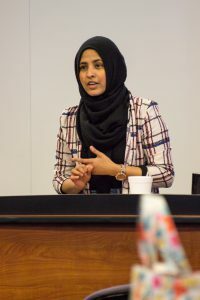 Shahina emphasized that if you are curious about something, there are many types of questions that you can get answers to from a quick Google search first. She encouraged people to not ask questions about a third party’s beliefs that the person you are talking to can’t answer anyway. Mahira noted that we all make mistakes where we don’t intend to make someone feel uncomfortable, but being conscious of the feelings and limits of people you talk to will show respect. What Islam is depicted as in the media, even by well-intentioned people, is not accurate, Sameeul said. It’s better to know people to see how their faith plays out in daily life. While global conflict is a factor, we should also be able to see the way peace is a key value for so many Muslims. 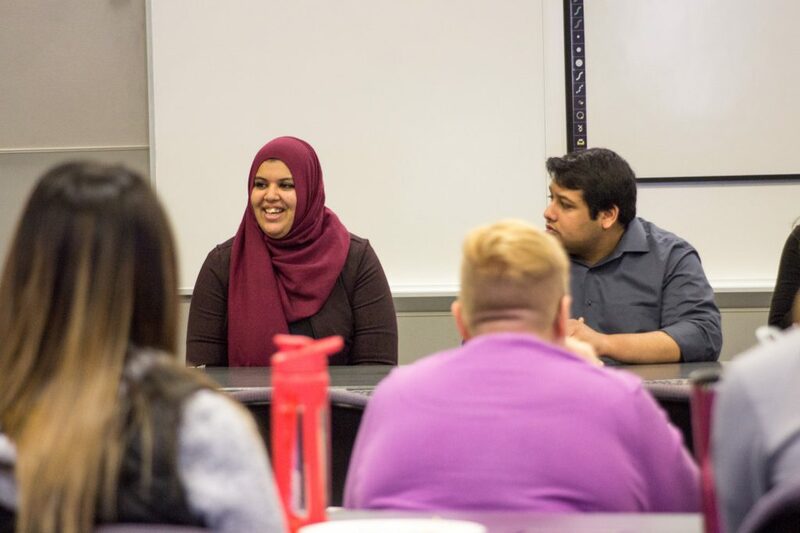 Saman agreed, saying she enjoys learning about other people’s faiths and cultures and thus also enjoys having that conversation with people about her own beliefs and culture. But, just like any other individual and their experiences within their culture, her view is not the only perspective. She said it’s important not to make presumptions based on one individual and apply it to everyone in that particular group. Have your professional opportunities been affected by your faith? 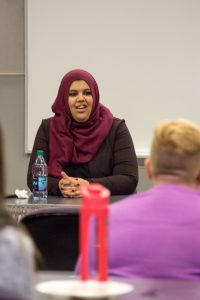 In college, a coach for moot court refused to work with Mahira Musani because she “didn’t look like a lawyer.” That made her less certain she wanted to draw attention to her faith or race in applying to law school, but her advisor said schools would want to see what she has to offer uniquely, so she still feels like she’s figuring out how to walk that line. Sameeul said his faith is a self-limiting factor in his professional opportunities because where his income comes from is important in Islam. He wants to avoid working in positions that do business in industries he is not comfortable supporting. Saman said people don’t always recognize her as a Pakistani Muslim, sometimes assuming she’s Native American or Hispanic. 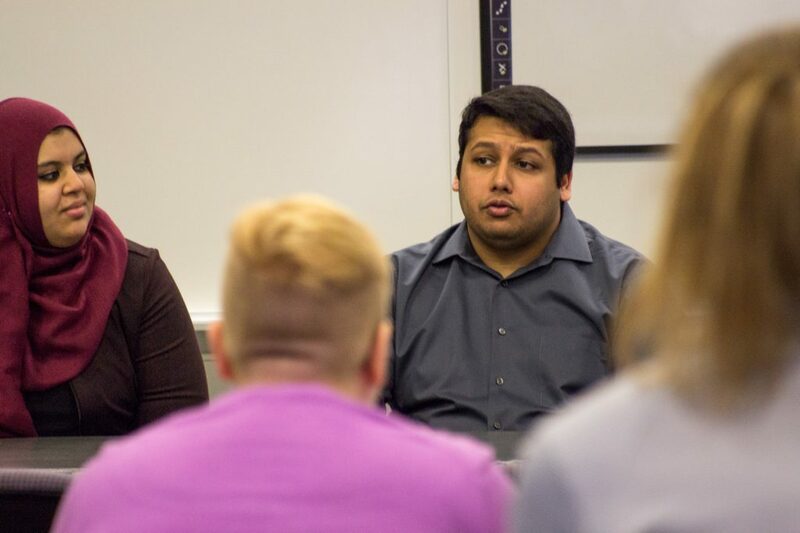 She doesn’t think she has had any opportunities denied, but does feel she had to defend certain opportunities she was able to apply for because of her diverse background. Having to defend that in law school for the first time was odd. Have you changed how you responded to ignorant or insensitive statements? Sameeul shared a childhood story about talking to a student who was Sunni instead of Shia and opening up conversations with his parents. He said when you’re young it’s easier to assume everyone understands your faith the same way you do, so you learn what you believe by contrast. But he’s also learned how people who asked very ignorant questions took his sarcastic responses very seriously, even when he was trying to brush them off. Saman said this is a skill she’s working on. Brushing off ignorance rather than getting frustrated and angry can be hard. She doesn’t want to come off as too aggressive, but she also doesn’t want people to think ignorant comments are acceptable.